Debt is the word on the tip of everyone’s tongue at the moment. Everyone has some degree of private debt, such as mortgages, personal loans or credit cards, but do we really understand what debt is? A debt is created when a creditor agrees to lend a sum of assets to a debtor. Debt is usually granted with expected repayment; in modern society, in most cases, this includes repayment of the original sum, plus interest. So, as most people would understand, debt must be paid back to creditors eventually. We also have a maximum amount that creditors are willing to lend us. Normally this debt ceiling is tied to our income and our propensity to pay back our debts. Whatever is borrowed must be paid back, with interest, and there is a limit to what we can borrow. But what about government debt? Surely that has to follow the same rules? Well, that is only partially true. 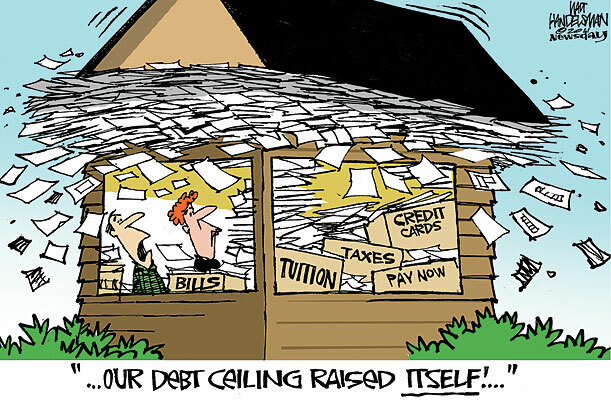 Governments do have to repay the debts that they rack up and they also have a debt ceiling. The difference between people and governments is that governments can vote to increase their debt ceiling which, in a world of spiralling debt that is getting close to being out of control, is a little scary. While most Australians would be well aware of our increasing level of national debt that Labor has saddled us with, what few would realise is that under this Labor government Australia’s debt ceiling has been raised three times in the last four years and the future is anything but rosy. Originally, Labor told us that the deficits were temporary and that increases to our debt ceiling would merely provide us with a buffer against the GFC. Well, we’re getting back into surplus in three years. Come hell or high water. The Budget is coming back to surplus, no ifs no buts, it will happen. However, the reality is that Australia’s deficits and resultant debt has been anything but temporary, and the oft promised surplus of 2012/13 is now just a distant and faint memory blip in the torrent of soundbites that we are bombarded with from a constant 24/7 media cycle. While most respected commentators realised that the promises of the magical surplus from Gillard and Swan were hollow platitudes, most of Australian’s took them at face value. How could you not after they trumpeted them far and wide to all that would listen for 3 years? Estimates abound that between them all Labor politicians promised the surplus over 300 times since 2010. Catallaxy Files has a great synopsis of the surplus promise timeline which makes for entertaining, yet infinitely depressing reading. Unfortunately for us, failure is the ONLY option when it comes to the Australian Labor Party and money. There will be no budget surplus in 2012/13 and as Wayne Swan confirmed in his budget speech there will be no surplus for the next four years, and when it does eventually arrive in 2017 it will be so wafer thin that it will have minimal impact on our economy. 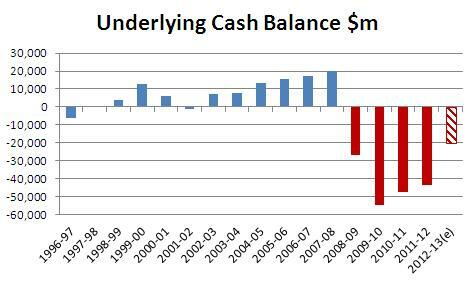 By that time the Australian economy will very well have passed the tipping point of no return. So what has Labor projected for the foreseeable future of our economy? Deficits, more deficits and even more deficits to come. This is on top of the accumulated deficits that they have already racked up since 2007 (see image at right). The last time a Labor Treasurer delivered a surplus was way back in 1989 so it’s hardly surprising that this year’s Labor surplus promises in 2013 are no more believable than the 300 odd promises they have given us since 2010. By the time that these clowns manage to eventually get the budget back to surplus our national debt will have balloned to more than $400 billion dollars, all but blowing our current debt ceiling out of the water. That is FOUR HUNDRED THOUSAND MILLION DOLLARS OF DEBT. Um, no Wayne me old mate. It is not just going to be a matter for the Liberals. It is going to be something for ALL OF US Wayne. You know us, the REST OF AUSTRALIA? If there was ever a clear cut example of the complete lack of care about this dire situation by the Labor Party, then surely Swan’s disgraceful comment must be it. Don’t worry about the NDIS or Gonski reforms being Gillard and Swan’s legacy. Labor’s legacy is a mountain of debt.